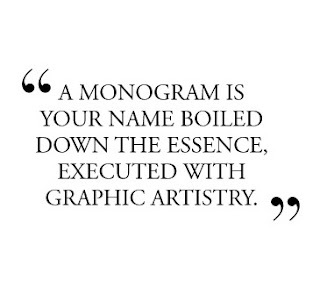 I know that I’m a little extremely monogram-obsessed. Clearly I am, because I have my own monogramming business and the name of the blog you’re reading includes ‘monogram’ in it. My Pinterest boards are full of everything monogrammed and I will always lean towards buying something with my initials. And even though I know so many of my readers and people I know love monograms, I know there are so many people out there that despise them. To each their own, I know, but I just have to explain why I love the little initials that we put on everything. The reason I love monograms is because it adds such a personal touch to everything. You can have something so basic and typical, but with your initials on it, it’s your own. I’ve never met anyone with MLS as their initials (except my mother, but see two paragraphs down), but I have met many Merediths. I know that when something reads ‘MLS’, or rather, ‘mSl’, as monograms go, it’s mine. Why is it so important for girls (and guys) to mark that something’s their own with their initials? I know it’s a little silly sometimes, but it seems to be a result of the need for an individual fashion. Now, before you get on me about how ALL ‘basic’ girls wear monograms, hear me out. We wear and use so many things that are so similar, whether it be a t-shirt, a purse, a notebook, etc. That’s inevitable. But when you put your initials on something, it becomes a sweet reminder of that it’s your own. It’s an ancient tradition to mark your initials, from the old times in BC, to the 80s, to today. Fashions may come and go, but with your monogram on something, it’s always yours and will always be an individualistic thing. It takes something so simple to the next level of truly owning it. See? Monograms were huge in the 80s. 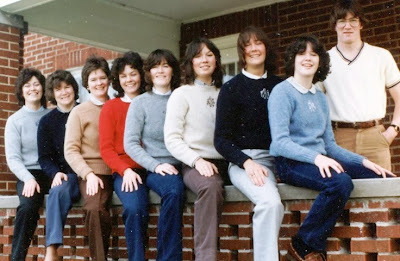 Monograms exist because of tradition. People can be so confused about why your last name goes in the middle, but you have to understand that it’s because we love our family name and family traditions. I’d much rather emphasize that I’m a Scroggin rather than emphasize that I’m a Meredith, and someday when I’m married, I’ll be happy to emphasize that I’m a _____ (fill in last name of future husband, and let me know, so I can go ahead and find him...) because I’ll be happy to be part of a couple instead of just a ‘Meredith’. Monograms love tradition, and tradition loves monograms right back. And call me crazy and call this a stretch, but wearing your monogram proudly is kind of a way to show that you’re proud of who you are. That could be contrived as ‘cocky’, but I disagree, as I find it a way to confidently show who you are. When people see me wearing a shirt reading ‘mSl’, they know that I’m Meredith Leigh Scroggin, and I’m not hiding it. 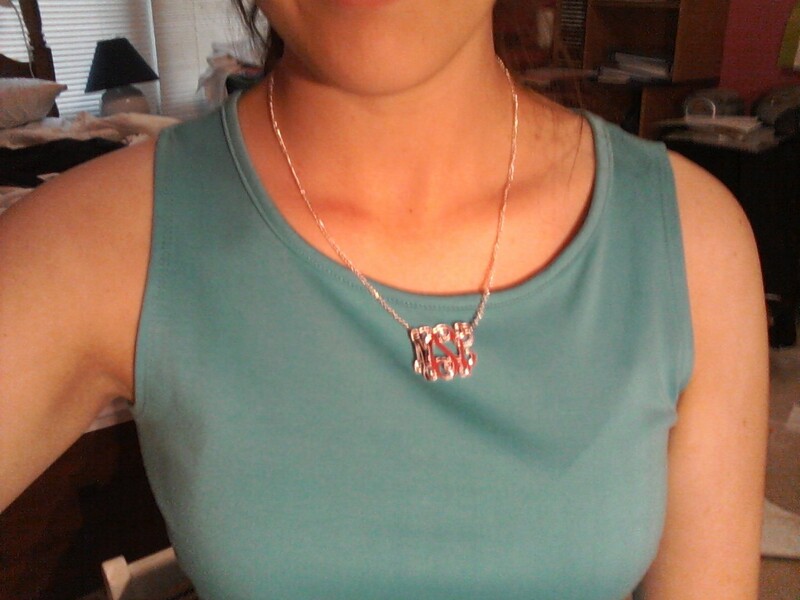 It’s the same as wearing a UK shirt (because we’re mighty proud of our wildcats) or wearing a brand name. After I had started thinking about this whole thing, I was eating dinner with my mom (another mSl) and I noticed that she was wearing monogrammed earrings. I asked her why she was wearing them, and she replied, "because they're monogrammed", where I, of course, smiled. But I asked her why she liked things monogrammed, and she said, "Because monograms are classy. They're unique and one in their own. I gave you my monogram to pass down that uniqueness. And it's a lot like your label- some people like wearing Polo or Tory Burch, but when you're wearing your monogram, you're wearing who you are." Maybe this is a rambled post and maybe it sounds defensive, but I really love monograms. It’s kind of hard to explain, but to be identified by three letters in a world of blending in is actually pretty cool. There’s an inseparable bond between seeing someone wearing something monogrammed because even though you won’t have the same initials, you know that they’re loving this beautiful thing as much as you do. I love monograms because it’s something that’s so personal. I love monograms because I love Monogram Meredith. And you can go ahead and hate them, but I hope at least that you understand why we ‘crazy’ girls love them so much, and maybe you’ll love them, too. Because I’d most definitely be willing to make a shirt for you. PS: My mom's maiden name was Smith and we joke that the only reason she married a Scroggin was so she wouldn't have to give up all of her monogrammed stuff. Well played, Mom. 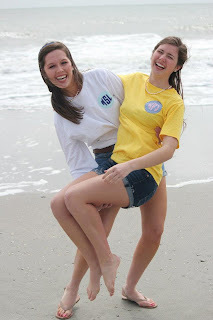 You definitely won me over to monograms in this post! Great work!